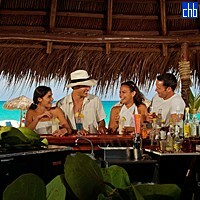 The Melia Cayo Santa Maria is a cut above the neighbouring and smaller Sol Cayo Santa María. This all-inclusive resort offers more luxury and is well worth the extra splurge. The setting on a gorgeous beach on a reclusive isle some 30 miles from the mainland tantalizes – you won't find white sands or waters or purer turquoise anywhere in Cuba. The main pool is a visual delight and is overhung by thatched king-size Bali beds. 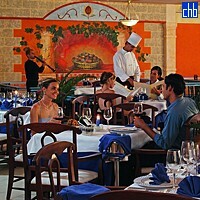 And the four restaurants offer greater elegance than at the Sol property. Options include Mediterranean and Italian restaurants. And the San Pascual bar (one of four bars on the property) has a clubby sophistication that wouldn't be out of place in New York. The entertainment here is kept going into the night, and the cabaret shows give the Tropicana a run for its money. The gym has modern equipment. And the spa here offers a romantic indulgence with its Romanesque mosaics, sensual drapes, and pampering attention from trained staff. You can even opt for him and her treatments side by side. Meliá's trademark turquoise, white, and canary yellow color schemes enliven the 360 air-conditioned rooms, all of which are Standards but for two Junior Suites. Two-tone tile floors, built in closets, sponge-washed walls, and gauzy drapes over the queen or king beds with wrought-iron frames offer a soothing touch. Ceiling fans are there for guests who disdain air-conditioning. The Melia Cayo Santa Maria is mostly enjoyed by couples and families, but also offers facilities for incentives groups and there is a special wedding and honeymoon program. 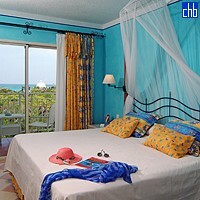 359 spacious, beautifully decorated Double Standard rooms (32 with views of the beach). Equipped with all the necessary facilities and services and set in a paradisiacal ambience of tropical vegetation and pristine beaches. 32 standard rooms with views of the beach. Cayo Santa Maria lies at the western end of the Archipielago de Sabana-Camaguey, 25 km west of Cayo Guillermo, in the Bahia de Buenavista ecosystem, declared by UNESCO as a “Biosphere Reserve”; in a setting rich with endemic species protected by a beach of incomparable beauty, with more than ten kilometers of fine white sand and a sea of varying shades of blue. The key (cayo) is united to the mainland by an impressive causeway called "El Pedraplen" constructed across the Bahia Buena Vista from the port of Caibarien at a cost of 100 million pesos. This engineering marvel built between 1989 and 1999, is over 48 km long and has 46 bridges, and is worthy of its Puente Alcantara Award. The bridges allow an exchange of tidal waters, an improvement over the earlier Cayo Coco causeway. Paving was completed in 1999, just as Las Brujas Airport was being built on Cayo Las Brujas, 45km northwest of Caibarien. Travelers from Remedios, a colonial town with its parrish church and to Santa Clara, seat of the Ernesto Che Guevara Memorial, cross crystalline and tranquil waters and keys, and can observe hawks, pelicans and the amazing pink flamingo.